The world’s tropical forests – the planet’s lungs – are in rapid decline. Over the past 60 years over 60% of them have disappeared, while two-thirds of those that remain are fragmented. 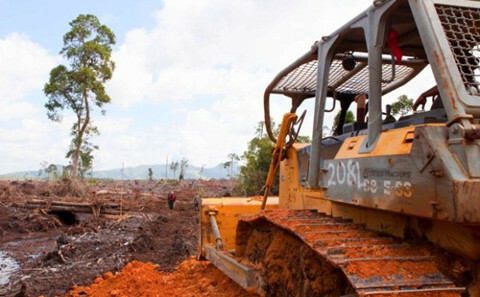 Demolition is driven, in large part, by logging, much of it illegal, which in turn paves the way for clear-cutting for plantations and agriculture. Deforestation is driven by international consumer demand not just for timber, but for everything from soy and rubber to palm oil and other supposedly climate-friendly biofuels. What makes this possible is the failure of governments to stir themselves beyond re-heated rhetoric about the importance of forests and the establishment of international talking shops that deliver little. What would make China’s leaders care about their impact on tropical forests? The International Institute for Environment and Development (IIED)’s new ‘China-Africa Forest Governance Learning Platform’ report demonstrates the role increased dialogue can play. It showcases an innovative collaboration involving African civil society representatives and Chinese officials, aimed at ensuring that China’s demand for African timber brings benefits to local populations. The report notes that African timber currently accounts for around 4% of China’s forest product imports, worth around US$1.3 billion. This demand is rising, and China’s role in the timber trade, globally, is pivotal. A study published by the Environmental Investigation Agency (EIA) last year estimated that China imported at least 18.5 million cubic metres of illegal logs and sawn timber in 2011, worth US $3.7 billion, constituting 10% of China’s total wood products imports. Chinese timber industry representatives contest some of EIA’s figures, but it is clear that alternative interpretations of available trade data cannot explain away a very serious problem. China is in good company, however. According to a European Commission study published on 2 July, Europe itself accounts for 36% of the international trade in products and commodities that drive deforestation, although it is home to just 7% of the world's population. Moreover, while domestic demand in China is escalating, the country remains the world’s assembly shop for many wood-based products. Chinese officials have long pointed out China’s wood processing firms are links in a supply chain serving consumers in Europe, North America, Japan and elsewhere. From the perspective of those participating in the IIED initiative, and anyone else interested in preserving tropical forests, focusing the debate on fair attribution of blame has obvious limitations. What is required is real global leadership to end forest destruction. Could China provide this? There are strong arguments, grounded in self-interest, for China’s leaders to take a fresh look at the world’s tropical forests and their role in keeping them standing. These start with the commercial case for overhauling the way the Chinese timber products industry operates. An immediate risk to continued business as usual is the US Lacey Act amendments of 2008 and the 2013 EU Timber Regulation which prohibit the import of illegal wood products. If enforced, these laws will eat into the profit margins of Chinese firms who cannot demonstrate that their timber is clean. Moreover, for a government that prides itself on ‘peaceful co-existence’ and ‘non-interference’ partnerships with developing countries, there is a reputational risk in being implicated in forest destruction. This was explained to me on my first visit to China some years ago by an official in Yunnan Province, who candidly described the damage that the illegal timber trade between Myanmar and China was having on relations between the two governments. Experiences from other countries where Chinese companies are at the forefront of natural resource extraction – notably South Sudan and Zambia – have likewise highlighted how questionable business practices can give rise to major diplomatic headaches. Beyond the short-term risks to business and to China’s reputation, there is the relationship between deforestation and climate change to consider. China is central to international debates on climate change, and has emerged as a champion of climate-friendly clean energy technologies. Stopping the destruction of the world’s forests is often cited as an easily attainable goal in efforts to slow global warming, yet it is one western governments have failed to grasp. Can China do better? An immediate step that the Chinese government could take would be to match or, better, improve on the American and European legislation prohibiting the import of illegal timber. While ‘legal’ should not be confused with ‘sustainable’, this would protect Chinese wood product exporters from international penalties and reputational damage. It would announce China as a leader, rather than a follower, on an issue of critical importance for many of its development partners and the wellbeing of the planet as a whole.